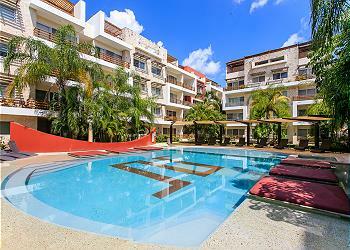 SABBIA CONDOS: SABBIA CONDOS: IS LOCATED JUST ONE HOUR SOUTH OF CANCUN IN PLAYA DEL CARMEN THE HEART OF THE RIVIERA MAYA, MEXICO. BEAUTIFUL NEW BOUTIQUE LIFE STYLE BUILDING TO ENJOY YOUR LITTLE PARADISE. SABBIA CONDOS IS THE BEST CONDOMINIUM BUILDING IN TOWN. FROM SABBIA IT IS EASY TO ACCESS TO THE BEACH (MAMITAS & KOOL BEACH CLUBS). THE FAMOUS 5TA AVENIDA WITH ALL ITS RESTAURANTS IS ONLY A FEW STEPS. WE OFFER BIKES THAT YOU CAN USE (JUST ASK YOUR CONCIERGE IN OUR OFFICE LOCATED JUST BESIDE SABBIA ENTRANCE). SABBIA CONDOS IS THE BUILDING IN THE DOWNTOWN AREA THAT GIVES YOU THE MOST FOR YOUR MONEY. IT IS A GREAT OPTION WHETHER YOU WANT TO SPEND A WEEK OR WANT TO LIVE THERE FULL TIME. YOU CAN RENT IT FOR 3 NIGHTS, PER WEEK, PER MONTH OR FOR THE WHOLE YEAR. Our condo was clean and lovely. We thoroughly enjoyed our 2 week stay. The staff were very prompt and helpful with anything that we asked them. Hi Joanne, thank you for sharing your evaluation with us! We are pleased you enjoyed your stay at Sabbia and had all you need to comfortably feel as at home! our apartment are constantly verified by our staff to guarantee the most amazing experience! We hope you give us the chance to host you again on your next visit! Warm regards from Playa Moments' staff! Unfortunately, the quality of the properties owned by Karina has declined. We had some issues that were not addressed in a timely fashion by her or her "concierge" on site: ants, noise and debris falling in apt. from construction upstairs, and no communication re: an approaching tropical storm. We're sorry to see that as she has added more properties to her portfolio, quality control has lapsed. Los departamentos en perfectas condiciones, muy cómodos y la ubicación es muy buena. La piscina también muy limpia. Lo aconsejo para familias y también para adultos solos. Hi Jose, thank you for your kind comments and evaluation we are always more than happy to help all our guest have a worry free vacation. We certainly hope we get the opportunity to welcome you back soon. Kind regards from the Playa Moments team! Very nice, clean and quite place. Good position and the property management has been professional and very helpful but the maintenance was'nt up to the price paid: the wi-fi did not work for 3 days and the a/c in the livingroom for 2 days. Have we been unlucky? A girls get away to just relax and get some sun. Good location close to all you will need. (food, beach, shopping & restaurant's ). if you are looking for peace and quiet this is it. it kick back and enjoy.